← How many Rings in the Pendlebury? In my previous post on the Black Bear Inn, I promised to take a more in-depth look at some of the programmes. What better way to do this than through the annual benefit concerts held for some of the leading players. I thought we might start with the one on 26th February 1798 for Charles Hague in which Charles Incledon, celebrity tenor of the time, took centre stage. Charles Hague (1769 – 1821) was not only a highly-respected violinist (he was a pupil of Antonio Manini – himself a pupil of Tartini – and Salomon), but also a singer, composer and Professor of Music in the University from 1799 until his death. His compositions included the Ode at the installation of the Duke of Gloucester (1811) and, intriguingly, arrangements of several Haydn symphonies for flute quintet. There is a striking portrait of him in the Fitzwilliam Museum by George Henry Harlow and a delightful appreciation of him in the Quarterly Musical Magazine and Review for 1822, pp. 123 – 128. 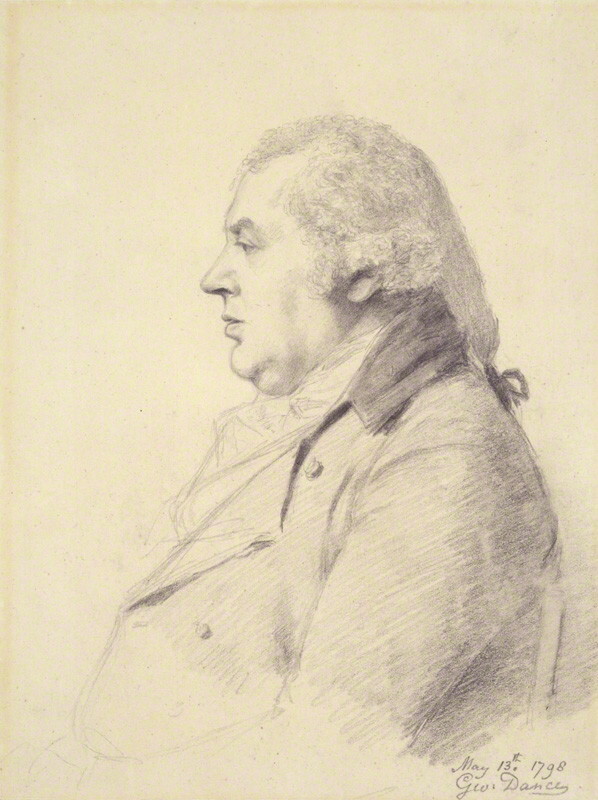 The same periodical also devotes space to a biography of Cornishman Charles Incledon (QMMR 1818, pp. 78 – 80), in which much is made of his fine tenor voice and its astonishing range (eat your heart out Juan-Diego Flórez), his immense success and his skill in delivering English ballads for which he was renowned. “He had a bold and manly manner of singing, mixed however with considerable feeling, that went to the hearts of his countrymen”. Hague’s 1798 benefit concert didn’t take place at the Black Bear Inn (the usual venue for its Music Club), but at the Town Hall. Presumably, this was because Incledon would have attracted a larger-than-usual audience for which extra seating would be needed. The programme itself, as can be seen from the image, is the typical mix of vocal and instrumental works, lasting considerably longer than those of today. We begin with a Haydn symphony: impossible to know which one, but perhaps drawn from those written for Saloman’s concerts at the Hanover Square Rooms which we now know as the London symphonies. The opening aria from Messiah follows (Handel was always a safe bet, such was his enduring popularity), which would have been sung by Incledon. We can only speculate on the concerto by Newcastle-born Charles Avison, but it would have been one of his many concerti grossi modelled on those of Geminiani. 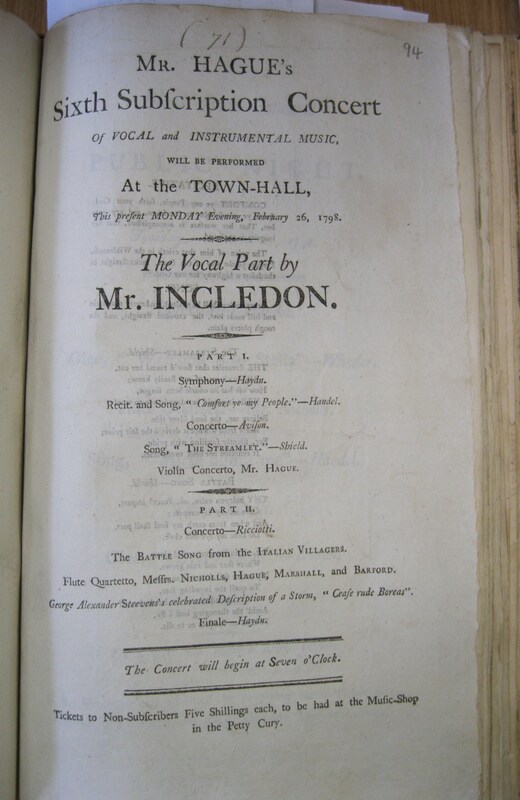 Incledon takes the stage next for one of two songs by William Shield (1748 – 1829), a friend of Incledon’s, pupil of Avison and prolific composer of stage works including Rosina (1782) from which it is alleged that the melody for Auld Lang Syne originates. Shield would become Master of the King’s Musick in 1817. The UL has a copy of this song, The Streamlet, from The Woodman (first performed at Covent Garden in 1791), “as sung by Mr. Incledon” at MRA.290.75.141. The interval followed an unnamed concerto (perhaps one by Tartini?) given by Charles Hague himself. Part II kicks off with another concerto grosso. Here assigned to Carlo Ricciotti (1681 – 1756), an Italian violinist and impresario who published six unnamed Concerti armonici in 1740 which, when brought out by Walsh were mistakenly attributed to Ricciotti. Recent research has established that they are by Unico Willem van Wassenaer (1692 – 1766). Another appearance by Incledon, this time with the Battle Song from Shield’s Italian Villagers of 1797 is followed by a flute quartet in which we see several of the regular players of the Black Bear Music Club: George Nicholls (flute), Charles Hague (violin), Mr. Marshall (viola) and Morris Barford (‘cello). Perhaps something by Ignace Pleyel (1757 – 1831) from the set of six from 1797 (B.387 – 92), who was a great favourite at the Black Bear. 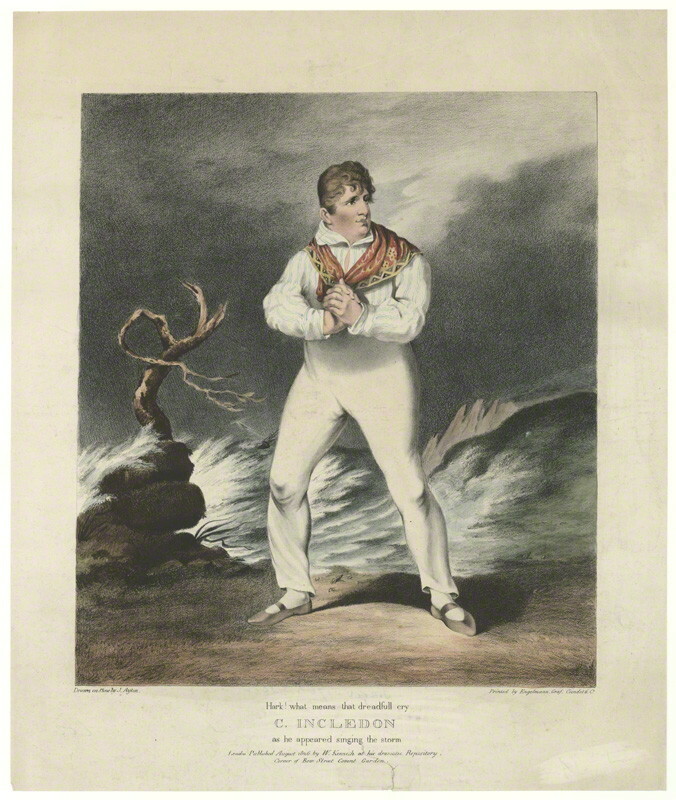 However, the eagerly-anticipated event of the evening was undoubtedly Charles Incledon’s performance of his party-piece The Storm or “Cease rude Boreas” by George Alexander Ste[e]vens. It describes a storm at sea and Incledon would often perform this complete with suitably scenic backdrop of a ship in distress to an enthralled and delighted audience. Such was its popularity that it and Incledon became virtually synonymous as this delightful vignette from the Boston Atheneum of 1826 illustrates. Let’s hope the Haydn “finale” was equally energising….the “Military” symphony perhaps, all the rage in London at the time. After which it was most definitely time to head home, or perhaps repair to the Black Bear for a pint…or two…and relive the excitements of the evening. This entry was posted in Uncategorized and tagged Black Bear Inn, Bygone concert venues, C18 music, Charles Hague, Charles Incledon, concert programmes, musical life in Cambridge. Bookmark the permalink.